'Moral Decay', Out of My Later Years (1937, 1995), 9. Anybody who really wants to abolish war must resolutely declare himself in favor of his own country’s committing a portion of its sovereignty in favor of international institutions. Even though the realms of religion and science in themselves are clearly marked off from each other, nevertheless there exist between the two strong reciprocal relationships and dependencies. Though religion may be that which determines the goal, it has, nevertheless, learned from science, in the broadest sense, what means will contribute to the attainment of the goals it has set up. But science can only be created by those who are thoroughly imbued with the aspiration toward truth and understanding. This source of feeling, however, springs from the sphere of religion. To this there also belongs the faith in the possibility that the regulations valid for the world of existence are rational, that is, comprehensible to reason. I cannot conceive of a genuine scientist without that profound faith. The situation may be expressed by an image: science without religion is lame, religion without science is blind. From paper 'Science, Philosophy and Religion', prepared for initial meeting of the Conference on Science, Philosophy and Religion in Their Relation to the Democratic Way of Life, at the Jewish Theological Seminary of America, New York City (9-11 Sep 1940). Collected in Albert Einstein: In His Own Words (2000), 212. I have never looked upon ease and happiness as ends in themselves–this critical basis I call the ideal of a pigsty. The ideals that have lighted my way, and time after time have given me new courage to face life cheerfully, have been Kindness, Beauty, and Truth. Without the sense of kinship with men of like mind, without the occupation with the objective world, the eternally unattainable in the field of art and scientific endeavors, life would have seemed empty to me. The trite objects of human efforts–possessions, outward success, luxury–have always seemed to me contemptible. In 'What I Believe,' Forum and Century (1930). In interview, Alfred Werner, Liberal Judaism (Apr-May 1949), 16. Einstein Archive 30-1104. As cited in Alice Calaprice, The New Quotable Einstein (2005), 173. In light of new knowledge ... an eventual world state is not just desirable in the name of brotherhood, it is necessary for survival ... Today we must abandon competition and secure cooperation. This must be the central fact in all our considerations of international affairs; otherwise we face certain disaster. Past thinking and methods did not prevent world wars. Future thinking must prevent wars. In the case of a Christian clergyman, the tragic-comical is found in this: that the Christian religion demands love from the faithful, even love for the enemy. This demand, because it is indeed superhuman, he is unable to fulfill. Thus intolerance and hatred ring through the oily words of the clergyman. The love, which on the Christian side is the basis for the conciliatory attempt towards Judaism is the same as the love of a child for a cake. That means that it contains the hope that the object of the love will be eaten up. Only the individual can think, and thereby create new values for society–nay, even set up new moral standards to which the life of the community conforms. Without creative, independently thinking and judging personalities the upward development of society is as unthinkable as the development of the individual personality without the nourishing soil of the community. Our situation on this earth seems strange. Every one of us appears here involuntarily and uninvited for a short stay, without knowing the whys and the wherefore. In our daily lives we only feel that man is here for the sake of others, for those whom we love and for many other beings whose fate is connected with our own. I am often worried at the thought that my life is based to such a large extent on the work of my fellow human beings and I am aware of my great indebtedness to them. The desire for guidance, love, and support prompts men to form the social or moral conception of God. This is the God of Providence, who protects, disposes, rewards, and punishes; the God who, according to the limits of the believer’s outlook, loves and cherishes the life of the tribe or of the human race, or even or life itself; the comforter in sorrow and unsatisfied longing; he who preserves the souls of the dead. This is the social or moral conception of God. 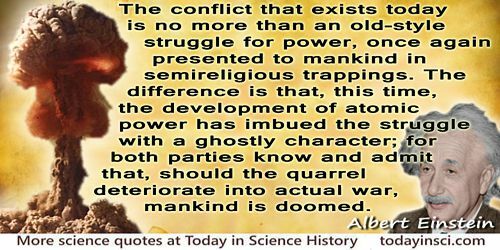 There are pessimists who hold that such a state of affairs is necessarily inherent in human nature; it is those who propound such views that are the enemies of true religion, for they imply thereby that religious teachings are utopian ideals and unsuited to afford guidance in human affairs. The study of the social patterns in certain so-called primitive cultures, however, seems to have made it sufficiently evident that such a defeatist view is wholly unwarranted. These thoughts did not come in any verbal formulation. I rarely think in words at all. A thought comes, and I may try to express it in words afterward. This is really the cornerstone of our situation. Now, I believe what we should try to bring about is the general conviction that the first thing you have to abolish is war at all costs, and every other point of view must be of secondary importance. You believe in the God who plays dice, and I in complete law and order in a world that objectively exists, and which I, in a wildly speculative way, am trying to capture. … Even the great initial success of the quantum theory does not make me believe in the fundamental dice-game, although I am well aware that our younger colleagues interpret this as a consequence of senility. No doubt the day will come when we will see whose instinctive attitude was the correct one. Letter to Max Born (7 Sep 1944). In Born-Einstein Letters, 146. Einstein Archives 8-207. 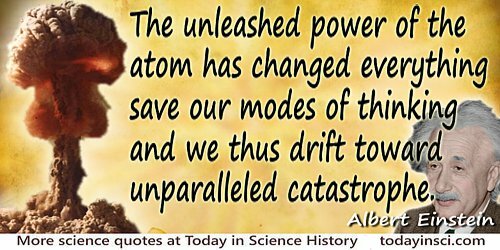 In Albert Einstein, Alice Calaprice, Freeman Dyson, The Ultimate Quotable Einstein (2011), 393-394. Often seen paraphrased as “I cannot believe that God plays dice with the cosmos.” Also see a related quote about God playing dice on the Stephen W. Hawking Quotes page of this website.